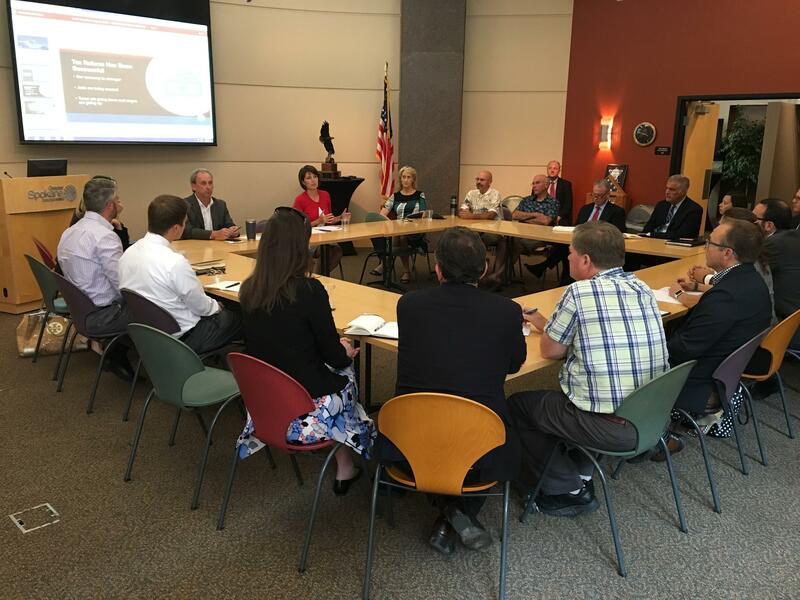 Republican tax reform legislation is responsible for fueling economic growth in the Inland Northwest, Rep. Cathy McMorris Rodgers told a panel of business and nonprofit interests Wednesday in downtown Spokane. “As I look at this legislation, what I’m most excited about what it has done is returning that optimism to Americans,” McMorris Rodgers said. The congresswoman has been touting job numbers and market gains as part of her push to retain Eastern Washington’s seat in Congress. Ashley Wilson, vice president of legislative tax strategies with the U.S. Chamber of Commerce, told the gathering at Greater Spokane Inc. that it was important to retain Republicans in the upcoming midterm elections to continue what she said was positive momentum for small business owners after the bill passed. The tax bill, which passed Congress in December without a single Democratic vote, continues to draw criticism tied to GOP promises of higher wages and job creation based on the assumption that businesses would pass on savings to their workers. Lisa Brown, the Democratic challenger to McMorris Rodgers, has criticized claims about the average amount of increased savings and take-home pay those in the district will receive as a result of the legislation. The fact-checking group Politifact has rated claims about how much the average person and family will pocket as a result of the legislation “half true.” The group noted that such calculations – including a Twitter claim by McMorris Rodgers that the average taxpayer would bring home more than $17,000 in additional pay over the next decade – are based on presumed growth in the economy that may not pan out, and don’t factor in households that had previously depended on certain tax deductions eliminated as part of the bill. Those were replaced with a doubling of the standard deduction a household can claim. A Bureau of Labor Statistics report issued earlier this month found that average hourly and weekly wages remained mostly flat from July 2017 to last month, when factoring in the rising cost of living. Average weekly wages increased from $350 last year to $351 this year, rebutting a popularly reproduced graph showing a decline in wages after the tax reforms based on unofficial data not confirmed by the U.S. government. The seasonally adjusted unemployment rate was 3.9 percent nationwide in July, its second-lowest monthly total in the past decade behind May’s 3.8 percent. Local unemployment numbers mirror the nationwide trend downward, with unemployment in Spokane County sitting at 4.9 percent last month, its lowest in more than a decade. Monthly increases in the number of available jobs since the tax reform bill was passed, however, have been mostly on par with strong totals that existed before President Donald Trump signed the GOP plan into law. The American economy added 862,000 jobs during the first five months of 2017, continuing a trend of nearly eight years of job growth begun in 2010 under President Barack Obama. In the first five months of 2018, the economy added 969,000 jobs. McMorris Rodgers has pointed to swelling confidence among small business owners, as measured by a Gallup poll, increasing amounts of personal household savings and stories of individual firms reinvesting their savings into workers and the community as evidence the reform bill has improved conditions in Eastern Washington. She also said the tax bill, which lowered the corporate tax rate, would spur the creation of jobs and products that can help the United States compete internationally. McMorris Rodgers, who will hold a town hall in downtown Spokane on Thursday evening, later Wednesday appeared with the group Job Creators Network, a nonprofit advocating on behalf of business interests. The organization has launched a nationwide bus tour that is intended to highlight the benefits of the tax bill for small businesses. Editor’s note: This story was updated Thursday, Aug. 23, 2018, to clarify that a national bus tour touting benefits of the tax bill for small businesses was separate from an appearance at Greater Spokane, Inc. Published: Aug. 23, 2018, midnight Updated: Aug. 23, 2018, 9:33 a.m.